GRAND CHAMPION, BREED WINNER, NATIONAL WINNER in CFA. CPR has an amazing personality ! CPR's name was chosen because at birth he was dead and I gave him CPR. CPR will be shown in Premiership by Co-owner Joyce Kempf and her Granddaughter, Alex. Nutella came to me from my friend Iris in Mexico. He has added to our gene pool in the USA and has a wonderful home in Chicago, IL. Wonderful Personality and Sweet Disposition. I couldn't have asked for more. Chip came to live with me in the month of August, 2015. He had been at Judy Bemis' home and had already made his Grand Champion status. Six month's into the show season, I asked if I could co-own and try to get a National Win with Chip. Judy said yes. So for 6 months we traveled about the USA and almost made a national win. We just needed one more show and Chip would have been titled as a World Winner. As it was, he was number 26th cat in the World and did not get the title. This was a tough year because it was really a "world win" rather than a National Win in which I thought I was trying for. Still, Chip was a perfect cat to take to shows and he became my stud for a couple of litters. He has now returned to Judy Bemis and will be used as a stud in her cattery. Argo is a beautiful silky brown boy with amazing eye color. He became shy and scared of other cats when he was exposed to a Bengal at a cat show. Argo was a kitten and the Bengal was benched across from him at a show. The Bengal growled and screamed at Argo. Argo began to shy away and hide. From that day forward, he never returned to a show. When introducing him to a female, I had to take extra steps to assure him the female was not going to hurt him. He sired 3 litters and now been neutered. He will soon leave for his forever home. Balsa was an amazing handsome cat. His eyes captivated anyone who looked at him. And his personality melted everyone's heart. He was taken to shows as a kitten and as an adult. Balsa was almost a one show Grand Champion . He missed it by one point. That is the closest I have come to making my cat a one show Grand Champion. Balsa was also a model for Advertising Agencies. His sweet personality and not a mean bone in his body made him a perfect model. You can still see him on the Advantage II package. The only thing they did was change his beautiful eye color to match the package. Still it is him. Balsa sired a number of litters, then was neutered and placed with a friend in a nearby city. I can still go to see him. I am so lucky ! I had always wanted to call a Blue cat Sky King and found this cat was the right one. He enjoyed high places and I would find him on top of the highest cat tree. It just seemed fitting. As an adult, Sky sired a few litters but none were show quality. They were petted out and Sky was neutered and placed in a pet home. Jazz came to my home from the Jamis Cattery. Very loving and sweet boy that enjoyed showing. In addition, he posed for a number of Advertising agencies . Jazz sired a few litters and then neutered. He went to a loving home in the Kansas City area. Prince of OZ enjoyed going to the shows as a kitten and adult. He was a delight to show. He sired a couple of litters, then was neutered and placed with a family in Illinois. I was so lucky to have had him for the length of time I did. Very smart and wanted to be held and loved all most every waking moment of the day. I was at the Breeder's home when Lion Heart was born and was not breathing. I held his little body while the breeder rushed him to the vet. The vet was over a 1/2 hour away, so I kept giving the baby puffs of air. He had a will to live and I thought of the movie Lion Heart. I thought he had the heart of a Lion. And I asked to have him when he was old enough. I took Lion Heart to shows as a kitten, then as an adult to get his Championship title. He didn't really enjoy going to the shows, so he became a stud and sired a few litters. Then he was neutered and placed with a family who wanted a brown boy. Risky Business got his name because as a very small kitten he tried to do everything the big boys in the home did. He ended up breaking a leg and was in a cast for a short period of time. That did not stop him from climbing and jumping. Risky sired a few litters but none would be show quality. So all went as pets and Risky was neutered and placed in a pet home with two small children. He has enjoyed the attention. Jack was co-owned by myself and Penny Hardy (Yaramaz Cattery). Jack was a wonderful cat that enjoyed going to shows and had a good time showing off to the judges and spectators. Once he became a Grand Champion and Regional Winner, he became a stud in my home and sired several litters. Many people were interested in adopting Jack the Cat (as he became known). And a lovely family in Pennsylvania adopted him. I am so pleased they continue to send pictures and stories. Poppo was sold as a Breeder and Show Cat. He earned his Championship title and then used as a stud. When the Breeder decided the European Burmese was not her breed, she asked if I wanted Poppo back. I had him shipped back to me and I used him a couple of times to keep the blood lines going. Then he was neutered and placed in a loving pet home. 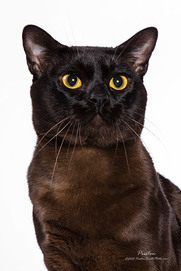 Asher was the first Brown European Burmese to become a Grand Champion. There had been one other brown to get the award Grand Premier. Since the judges usually do not use the Brown European Burmese this was a tribute to how structurally sound and how well he met the European Burmese standard. He could not be denied. Asher enjoyed going to the shows and did not know a stranger. After his show career, he became a stud for my cattery. He sired a few litters then was neutered and placed in a pet home. The person who adopted him, moved and could not keep him. Another person contacted me right away and asked if she could adopt him. He didn't get to stay with me long before he was in his new forever home. He's a Doozer was a very sweet loving boy but did not produce any kittens that would be show quality. So all his sweet sweet kittens went as pets. He was then neutered and placed in a pet home. Prancer Dancer received his name after I witnessed him prancing like a Liposome Horse. He was a wonderful show cat and enjoyed being handled by everyone. It was at a show that a young couple asked to adopt him. I advised they would need to pass my adoption study before I made up my mind if they would be the right home for him. They were and he traveled with them from Missouri to Connecticut and back to the Midwest. Then several years later they adopted a Bengal who gave him an upper respiratory infection. As long as Prancer was around this other cat he kept having problems with his breathing. The couple contacted me and asked me to find him another home. Lucky of Prancer he found a home without any other cats and his upper respiratory issue has gone away. Beau Jangles was shown until he became a Champion in CFA. After that he was allowed to try to mate with several different girls. However, he was too aggressive and I had to neuter without getting any kittens from him. He was placed in a pet home and has a wonderful life with a family of 5 children and three other neutered male cats. Linus was named after a friend of mine. He was a Blue Angel and his call name was Linus. Linus was shown as a kitten; adult and an alter. Due to his interest in female cats, he was shown until he became a CH. After he sired a number of litters, Linus was neutered and shown in Premiership. He earned the title of Grand Premier . I had thought I would keep him for ever and had given my heart to him. But he did not get along with the 2 spay females in the home. So he had to be placed. I sat at the airport and sobbed as he flew to his new pet home. He is well loved and I am happy for the family who got him. Kaspurr was shown in CFA as a kitten. He became Best EB in the Midwest region. Later he was shown as an Adult in CFA. He was the Best EB as an Adult in the Midwest Region. Kaspurr was taught agility and performed one time. He enjoyed the attention he received a little bit too much. After each trick the audience would clap. He would then run toward them to receive their praise. It messed up the time he completed the course, but he had fun. Kaspurr sired several litters, neutered and petted out to a loving home. 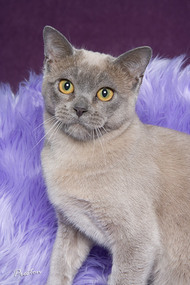 Mani went to shows as a kitten and received Best European Burmese Kitten in Region 6. He went on to achieve Grand Champion title and best EB in Region 6. Mani sired several litters, was neutered and then was shown in Premiership. He became a Grand Premier and best EB in Premiership in Region 6. After his show year, Mani was placed in a Pet Home. Berto sired several litters then was neutered and placed in a pet home. Sunny was shown in CFA and became a Champion before he decided he didn't like to show. He sired several litters then neutered. He was placed in a pet home for a paraplegic. Xander was shown in CFA, Provisional; Miscellaneous and Championship classes. He helped get the European Burmese accepted in the USA. Retired: Neutered and placed in a loving pet home.